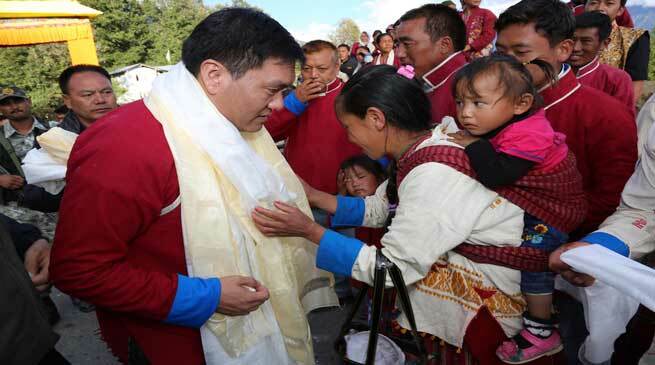 Chief Minister Pema Khandu in his second day of road journey to Tawang was accorded an unprecedented reception on arrival at various villages and towns by the public of Tawang and West Kameng district in his maiden visit as Chief Minister. Huge number of public turned up at various locations en route to Tawang and was seen to be very glad to receive the Chief Minister Pema Khandu. People waited right since early morning to receive the chief minister at Sela, Jang, Lhou, Khrimu, Bomdir, Kyableng, Khartot, Lemberdung, Bomba-Bumteng, Changprong, , Urgelling, Changbu, Nehru market and old market. The Govt officials of the district gave a pompous civic reception to the Chief Minister at Circuit House. Earlier, the Chief Minister left Dirang at 0630 Hrs, where he halted for a night. He was escorted till Sela Pass by Parliamentary Secretary (Health and FW) Phurpa Tsering, DC West Kameng Dr. Swarup Sonal, SP Bomdila PN Khrimey , ADC Dirang D. Riba and other public leaders. Thereafter the public and officers of Tawang District accorded a grand reception to the HCM on his maiden visit to Tawang. The Chief Minister accompanied by 42 BRTF Commander RS Rao on way to Tawang inspected the proposed Sela tunnel that will curtail travel time to Tawang by one hour. He also attended a public meeting at Senge village in West Kameng district, where local public appealed the CM to address the issue of power crisis in the area. While addressing the public at various places enroute Tawang, Chief Minister Pema Khandu exhorted them to continue the atmosphere of peace and tranquility in the district. He appealed them to rise above party line for proper development of the district and the State as whole.